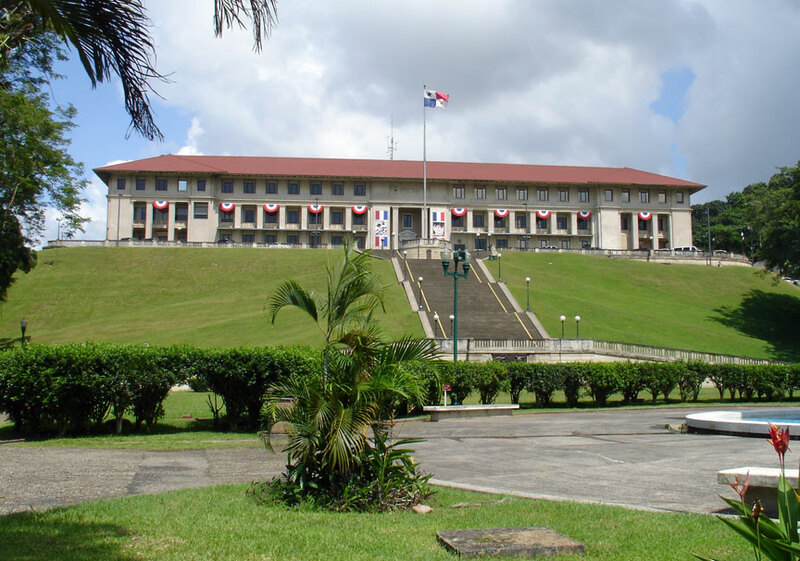 The Panama Canal Administration Building was inaugurated on July 15, 1914, exactly a month before the Canal itself. Since then, this veritable legacy from the past has continued to dominate the Balboa area from atop its rolling hill. 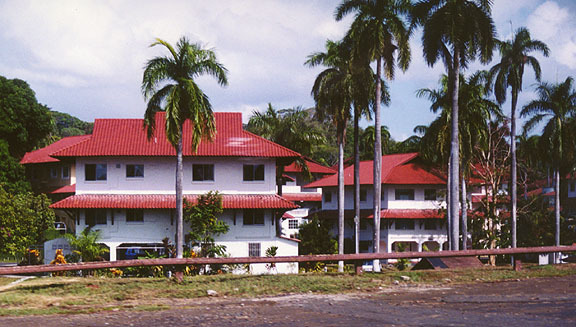 The Administration building houses the Panama Canal Authority's chief administrative offices, such as those of the Administrator, and the Deputy Administrator, located since 1914 in the North wing of the second floor, overlooking Balboa and the Canal's Pacific entrance. Chief Engineer George W. Goethals set his sights on the construction of a permanent building to physically centralize administrative activities in 1912 - around the same time the Gatum Locks and lake were receiving their finishing touches. Austin W. Lord, hired from a New York architectural firm, traveled to Panama to study site conditions and develop designs that would dictate uniformity for a series of buildings in the Canal area.. By 1913, Lord had already developed plans for the Administration Building, the three locks control houses, the Balboa and Christobal train stations, the Gatum hydroelectric plant and the El Prado residences. Inside one in immediately struck by the beauty of the high-domed rotunda, the main attraction of the historic building. 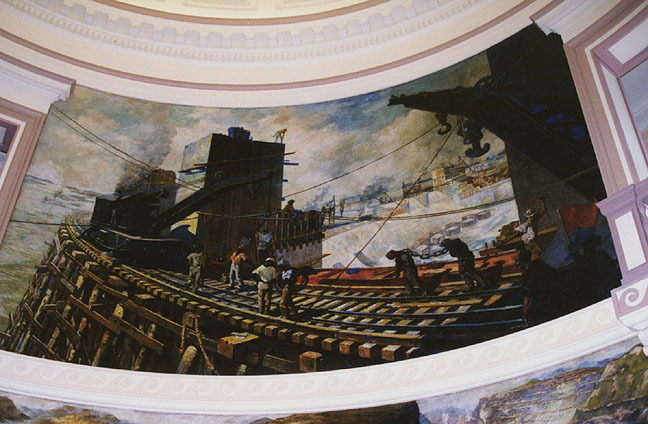 The dramatic murals, which adorn the cupola, along with the stately marble columns and floor, complete the impression. 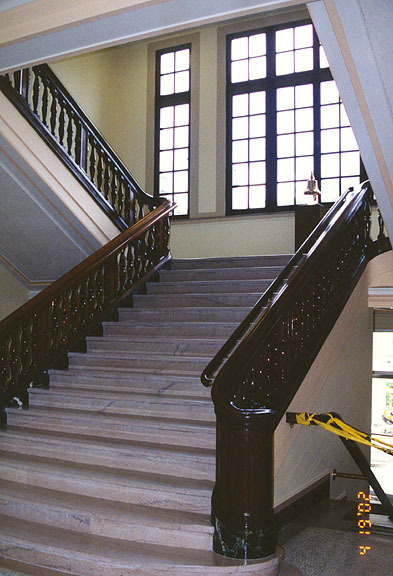 Exiting the rotunda, one comes upon the main staircase, a work of art in pink Tennessee marble, with elegant Mahogany banisters that denote the luxury in which the imposing structure was conceived. According to records dating back to the construction era, the entire building cost $879,000, a sizable sum at the time. 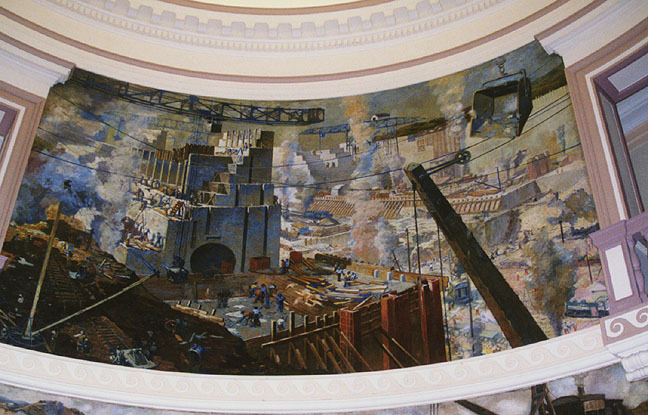 The murals that adorn the rotunda were painted by New Yorker William Van Ingen, also celebrated for his murals in the U.S. Library of Congress and the Philadelphia Mint. 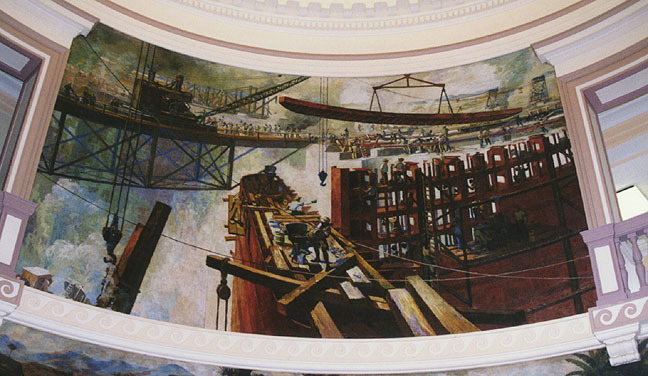 They depict the monumental labor involved in building the canal. Together, these murals narrate the efforts, courage, and heroism of the multinational workforce the gouged through the Isthmus of Panama to unite the World's two greatest oceans. Today. 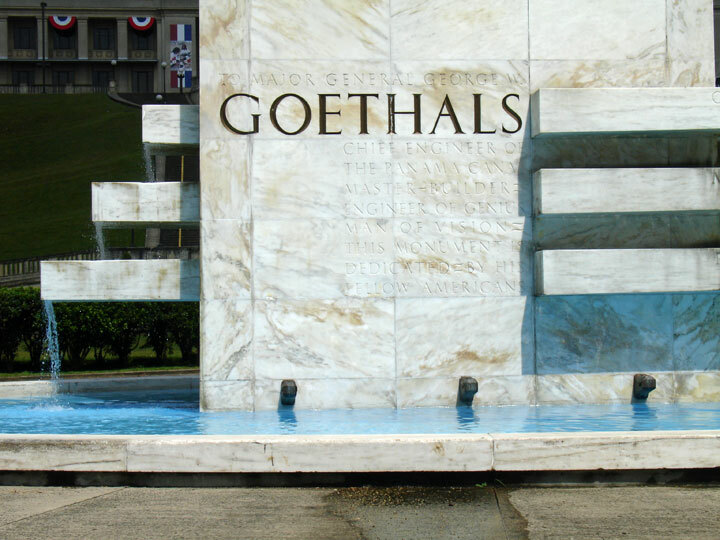 Goethals is acclaimed for having had the foresight to record the monumental labor involved in the construction of the Canal through these poignant works of art, the largest group of murals by a U.S. artist in exhibit. The Panama Canal is an artificial transportation waterway, built during 1904-1914, that serves as a transport canal for international trade, recreational use and irrigation purposes. To this purpose, it reduces the long distance travel of cargo ships because it connects the Pacific and Atlantic Oceans, thereby reducing their journeys by thousands of miles. The canal, a.k.a. “Big Ditch”, is regarded as the eighth man-made wonder of the world due to its size and the large volume of shipping vessels it can accommodate. The earliest known attempt to construct the canal was in 1534 when the King of Spain (Charles V) suggested that a route created through Panama would reduce the distances journeyed by ships that travel from Spain to Peru, and provide measures to give the Spanish military an edge over the Portuguese. During 1788-1793, a feasibility study of the canal was carried out by Alessandro Malaspina, who then proposed a plan for the construction. This was later followed by the “Darien Scheme”, an unsuccessful effort designed to create an overland trade route launched in 1698 by the Kingdom of Scotland. In 1855, the Panama Railroad was built, as well as a survey on the proposed route, which was carried out by William Kennish. Charles V., King of Spain: He brought about the idea that waterways should cut through the Panama Canal in order to reduce the time taken for transatlantic voyage. Alessandro Malaspina (canal is possible): Brief history of the Panama Canal, and how he proved the feasibility of the canal by outlining plans for its construction. Darien Scheme (failed attempt): A collection of books and pamphlets that establish details of the attempt by Scotland to establish a trading colony at Darien. William Kennish: His major contributions, how he discovered that the level of the Pacific and Atlantic were the same, and the cost of the tunnel. From the Atlantic to the pacific: The purpose for constructing the panama canal, how it came to be, how the French first constructed it and how it was completed by the Americans. Time Line: The time line history of the Panama Canal, past events, famous people that were involved and important dates. History of the Panama canal: A comprehensive history of the panama canal. Video story about the Panama Canal: Film compilation about the Panama Canal, early attempts, the actual construction and its operation. Construction of the Panama Canal: The main purpose for constructing the canal, the Clayton-Bulwer treaty and Hay-Bunau-Varilla Treaty, and United States support of Panamanian independence. French attempts to construct the Panama Canal began under the command of Ferdinand de Lesseps in 1880. Excavation on the region the canal was to be constructed in was hastily done, without properly investigating sensitive regions for hydrology and geology information. Due in part to the lack of planning, there was an outbreak of epidemics which affected and killed a large number of employees such as top French directors and laborers that were assigned to that project. In the long run, the French construction of the canal was abandoned due to these challenges. What is Hydrology: All about hydrology and what hydrologists do. 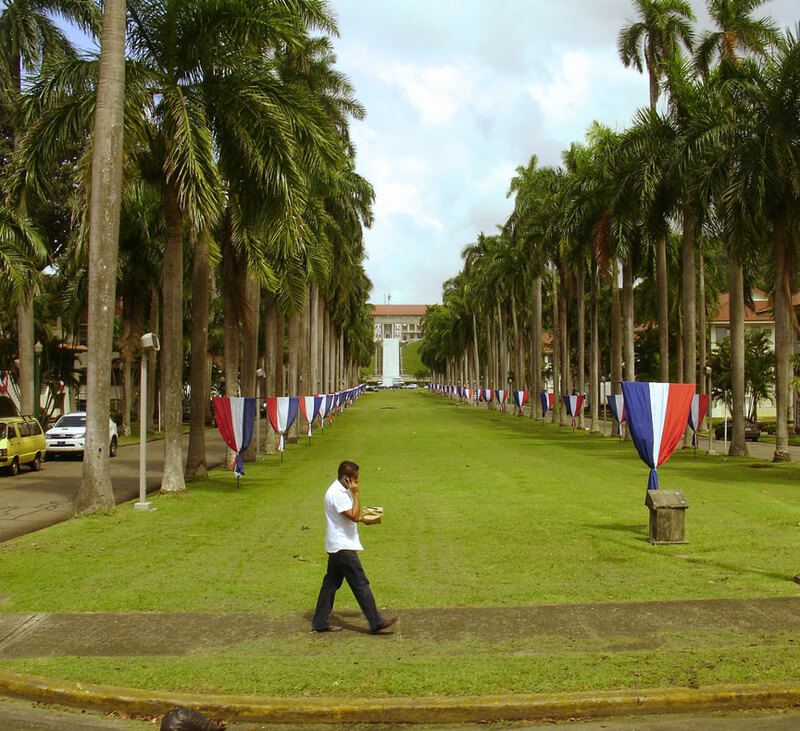 Panama Scandals: The panama scandal information, how it affected large numbers of individuals and institutions. Pre-canal History: T he Colombian government gives the French permission to build a Panama Canal, and information on when it was dug. Geographical issues: Information about the ecological issues of the Panama Canal, where it is located, and the consequences to the canal if the rain forest is destroyed. French Attempts: French work began in 1889 with hindrances such as disease, construction problems and inadequate financing. The construction of the canal by France: The geographical society of Paris asked for international co-operation about the knowledge of the Central American area with the intention to build a canal. Construction on the Panama Canal commenced in 1904 by the United States, after the French equipment and excavations were bought for 40 million dollars by President Theodore Roosevelt. 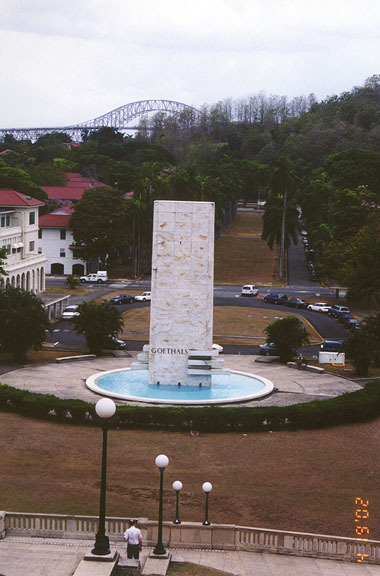 This was possible because at the time the United States expressed interest in building a canal across the Isthmus, the Panamanian ideal was voted on and recognized by the Senate of the United States. The treaty was later endorsed by John M. Hay, United States Secretary of States and Dr Tomas Herran of Columbia. William Nelson Cromwell (pdf): The Panama Canal treaty, and how he played an active role in the construction of the canal in panama by the United States. Theodore Roosevelt: His involvement in the construction of the canal by putting it under the command of the United States Army Corps of Engineers. Hay-Herrán Treaty: General information about the treaty. 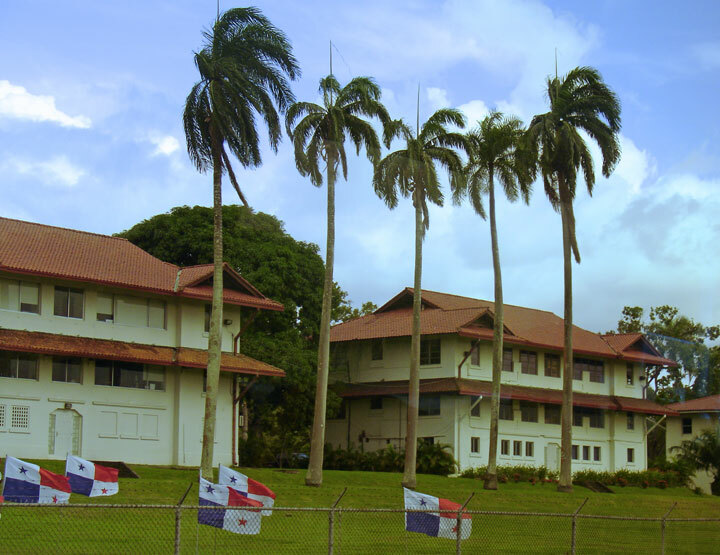 Panama Separatist Movement: All about the Roosevelt Corollary, its history and facts. Phillipe Bunau-Varilla: His contributions as a chief engineer in the French canal project. Thomson-Urrutia Treaty: A comprehensive treaty resource, including the Thomson-Urrutia Treaty of April 20, 1921. Panama Canal and Theodore Roosevelt (pdf): Questions, discussion guide and political cartoon about the canal and Roosevelt. Panama Canal Treaty: Article provisions as agreed upon by the United States and Panama. The Isthmian Canal Commission was formulated by the United States Government to supervise the construction of the canal. The commission was established in 1904 and Joseph Bucklin Bishops was appointed the Executive Secretary, over which the sovereignty of the canal was freely exercised by the United States. The Isthmian Canal Commission: All about the Isthmian Canal Commission and how it shaped the lives of the workers in the canal environment. Joseph Bucklin Bishop: An overview of Bishop, his publication time line, works and useful links. William Howard Taft The canal was completed during his tenure as president. 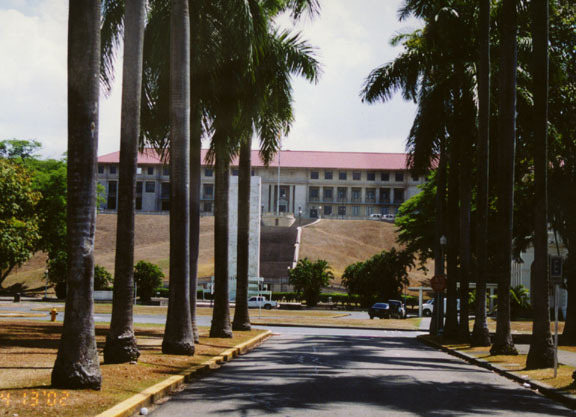 Panama Canal Records: An overview of the records related to the Panama Canal. The canal location was carefully investigated by the United States. The Chief Engineer, John Frank Stevens, convinced President Theodore Roosevelt of the feasibility and quality of a canal built with locks and dams. 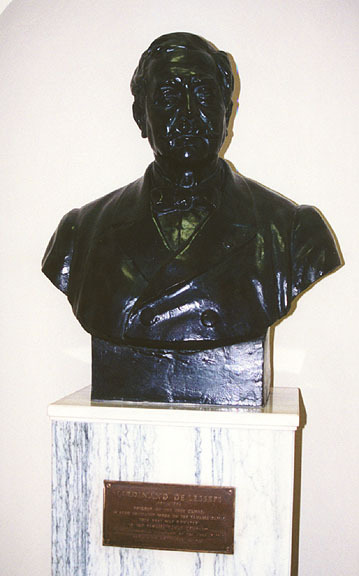 Diseases were kept under control, especially malaria and yellow fever, mostly thanks to the work of Dr. Carlos Finlay. A Cuban scientist and physician, he identified the mosquito as being the carrier of malaria fever. Explosives were used to break up hundreds of cubic yards of materials, and were carried away in railroad cars with the help of steam shovels that were fixed on railroad tracks. Some equipment used for the construction includes: enormous steam powered cranes, rock crushers, dredges, cement mixers and power drills. French equipment, such as hydraulic crushers, was replaced by American machinery. In addition, extensive electric generators and large distribution systems were built. 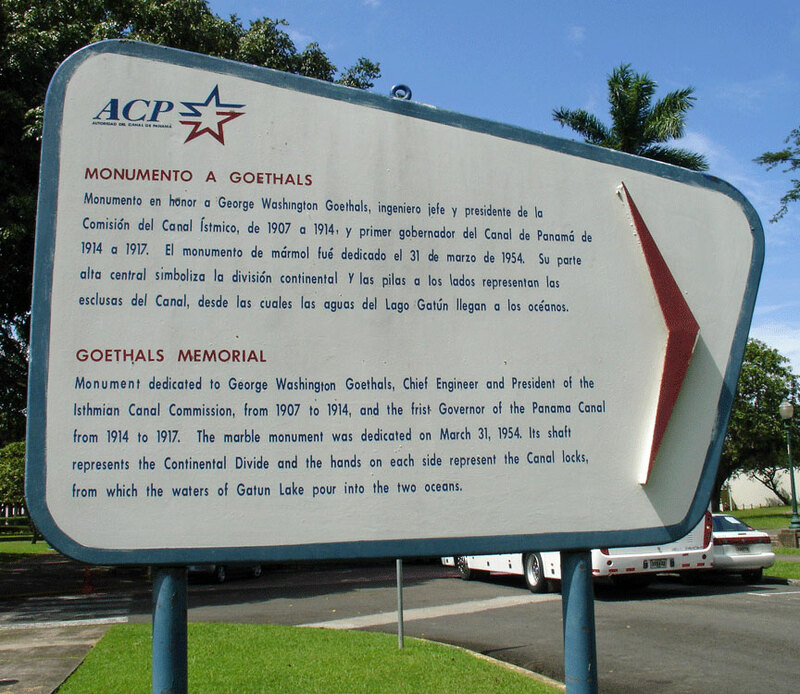 And in 1907, George Washington Goethals was appointed as chief engineer of the canal, after the resignation of John Frank Stephens. The canal was finally completed in 1914, and was officially opened the same year. 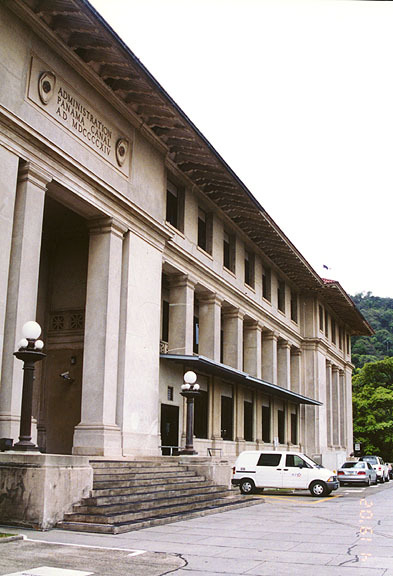 John Frank Stevens: Headed by Stevens, the Panama Railroad was brought into existence. Dr. Carlos Finlay: His hypothesis later resulted in the elimination of yellow fever. Sickness: The effects of tropical disease such as yellow fever and malaria, in the construction of the panama, and how William Crawford Gorgas, was appointed as a sanitary officer to prevent the spread of the infection among the laborers. Dams and Locks: Photos about the canal lock during the construction of the canals and facts about the canal locks. Lock Size: Panama Canal achievements, lock sizes, approximate distance saved and tolls. Layout (pdf): Photo Information about the length, height, 3 sets of locks and the artificial lakes of the canal. Equipment Used: Information about the crane equipment used during the construction of the canal. 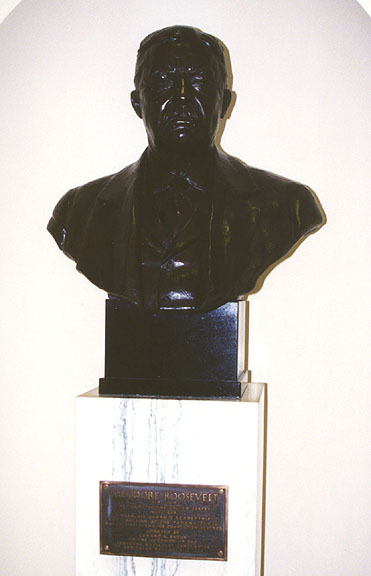 John Stevens, original Chief Engineer of the Panama Canal: Lead the canal work force in making the canal a clean and comfortable place to live. The Madden dam was constructed in the 1930s to prevent shortage of water to the canal. 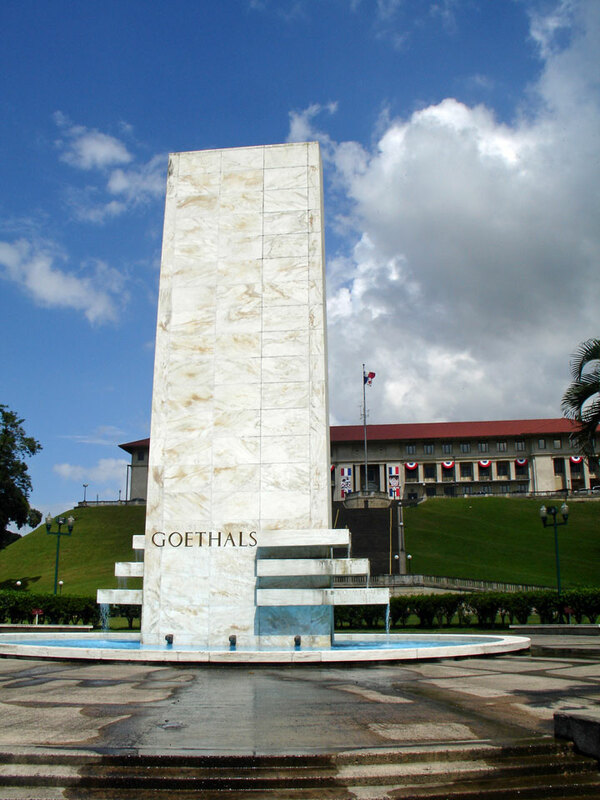 It was constructed above Gatun Lake, and across the Chagres River. Madden Lake was also created to act as a backup source to store water for the canal. However, by 1939, a larger lock was constructed and other expansive excavations were carried out to accommodate bigger ships. Today, the 51 miles long Panama Canal is regarded as one of the world’s greatest engineering accomplishments ever achieved. In 1999, on December 31st, the United States signed over the rights to the Panama Canal to Panama. Capacity (pdf): An overview of the capacity of the canal including photos and graph about cargo information and transit of the canal. Control: Information about the control of the canal the signing of a treaty by US President Jimmy Carter in 1977 leading to its complete control by the Panamanians. 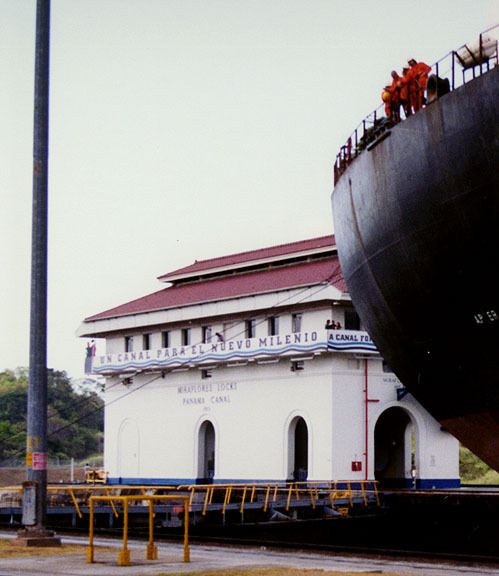 Panama Canal: Facts about the Panama Canal from the Panama Canal Museum. Panama Canal Coast to Coast: Panama Canal map of the distance from coast to coast which measures about 80km. Tolls: Panama Canal tolls have played, and will continue to play, an important role in commerce. Created for various purposes, there are many other canals around the world. Some of these include the Amsterdam-Rhine, Stockholm, Suez, Alappuzha, Nan Madol, Suzhou and Bruges Canals. One of the most well-known canal systems is located in Venice, Italy; it is common to hear a city with canals referred to as having a 'Venetian' quality. Canal Construction at Barge: Resource about the Barge Canal in New York, and how it plays a significant role in the barging of oil and in military history. Illinois and Michigan Canal: Facts about the canal, history, accessibility, activities for kids and adult and its location. Venice Canals: General history of Italy's Venice Canals. Canals in Amsterdam: Historic overview, facts and videos about the development of canals in Amsterdam. Canals in Britain: Information on history, maps and useful links about the British Canals. Midi Canal: Photographs, detailed maps, lock size, technical data and a brief overview of the canal. North and South Oxford Canals: Resourceful information that includes the location, history, maps and photos of the canal.